Commissioned Ring Twin Gem Crossover, little finger ring set with x2 old mine cut Diamonds (Oma Poesiat) 9ct palladium white gold with Rose Gold details. 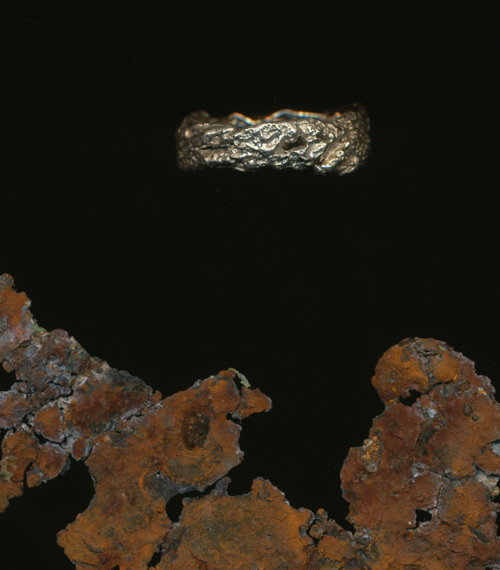 I have shown the earlier ring that was so worn it was beyond saving . 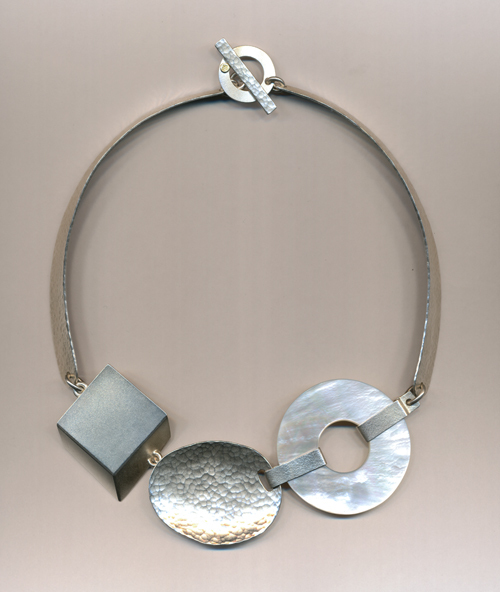 . .
Barbara and Juan-Luis have housed many large gems with their textured rub over setting technique, 18ct yellow gold extruded star wire length and small bale to suit her pendant design and her own gems. Winged its way to Sydney last night and I’m expecting the phone call soon . . . awaiting the oohs and aahs! 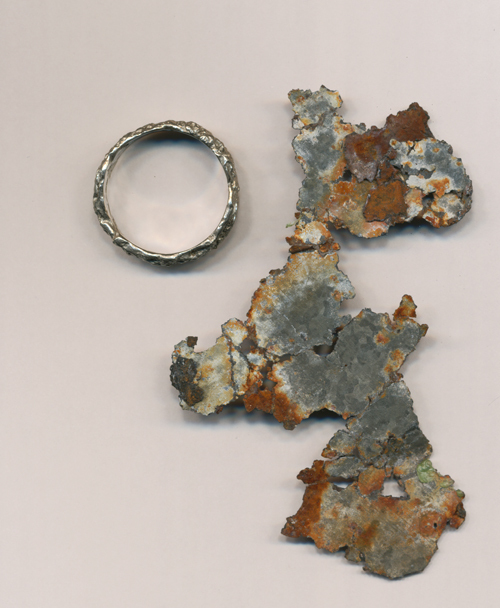 His textured wedding band into the mix, her engagement ring also becomes her wedding band. Congratulations dear Emma and Ray in Hobart! 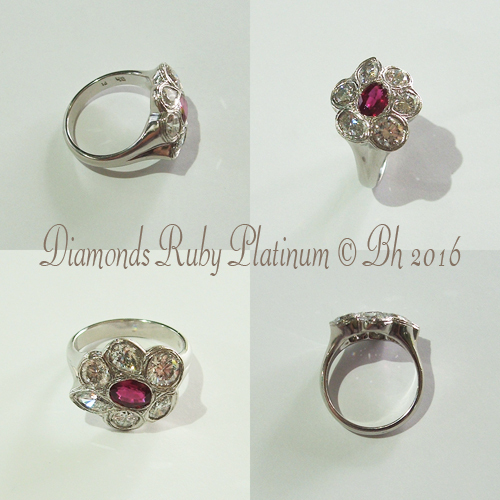 The big three – Diamonds Ruby and Platinum, Jenny said to me on the way out “once you’ve done platinum you never go back to gold” just the feel and the weight. Barbara broke up numerous wonderful things that just didn’t work . . . she does this a lot of late. 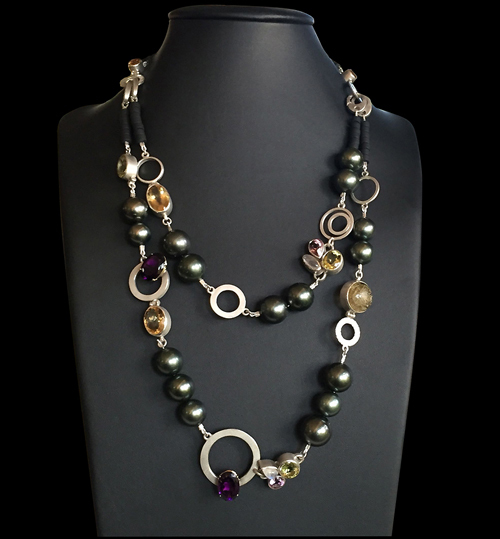 I’m sworn not to divulge jeweller’s names – the Tahitian pearl strand never looked so good . . . the two front strung lengths are each removable. Reconstituted emotive material with an eye to handing down.